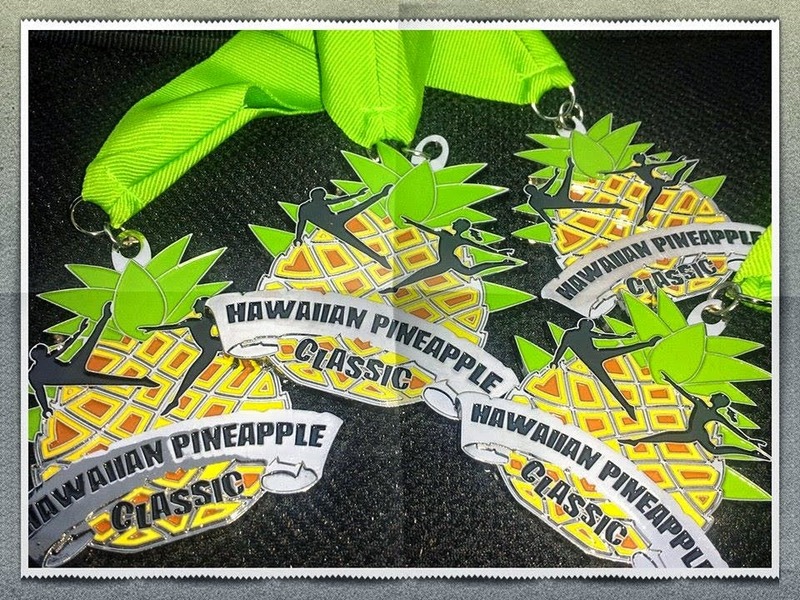 After this blog post, I promise I'll lay off on the proud mama posts, at least till the meet next month. Thanks for bearing with me. I know we've been all over social media with the gymnastics pixs since Friday. These kids work SO hard and practice long hours to push their limits, and it's so exciting to see them fly! Sagezilla had her first gymnastics meet of the season Sunday. She was worried, anxious and said her stomach was chasing it's tail.We've always told the kids it doesn't matter to us if they win or come in last. It's more important to have fun, make friends, and build up an encouraging team. We tried to reassure Zilla that there's no pressure to score x number of points or outdo anyone. We said as long as she remembered her routine and got out there and did her best, we'd be proud of her, no matter what. The kids have done park gymnastics since they were both 1 year olds, not to win at all costs, but to strengthen their bodies and brains, and increase their flexibility. She was freaking out too much to eat, but we finally got her to settle down by encouraging big yoga breaths. But it was a stressful morning. In the end, all the fear was for nothing. Sagezilla came home with 5 blue ribbons--first place in vault, bars, beam, floor and all around! Last year, she only did one full blown gymnastics meet where she placed 8th all around and her highest place was 5th in vault. By the end of the day, she was beaming and ecstatic. The same kid who was a ball of nerves in the morning, ended the day saying she loves gymnastics so much she wished she had meets every day! Check out our full set in the slide show here and favorites embedded below. We were a bit worried when they put Sage in the senior age group, while her team mates, including a girl who is a mere 5 days younger, were all in the juniors. Sage will still be just 11 till mid May. At the Winter Classic, they split the kids into a field of 12 competitors, so the cut offs weren't by a set age or birth date but by number. Still, she held her own and did a fantastic job against the older, bigger kids in the seniors group taking 1st on bars, 2nd on beam and vault and 3rd all around! The Chicago Comets also took Team 1st! For weeks, my 11 year old, Sage, has been obsessed with the idea of winning a snow globe trophy, only given to the top 3 athletes in each level. 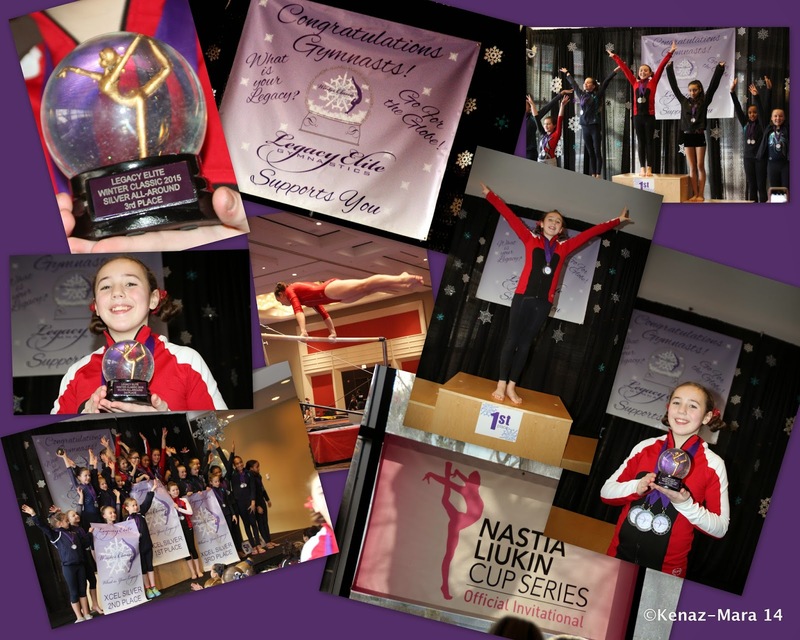 She competed in the Winter Classic two years ago and didn't even place, so she's spent the past two years honing her skills and all the hours of practice and fierce determination paid off! Go for the Globe Indeed! We're not hugely competitive as parents and were always the type to encourage our kids to do their best, but not push winning. We always made a point of telling them we're proud of them win or lose, and that learning to lose without tears and win without gloating are as important as the actual sport. Sage began gymnastics as a tiny 18 month old in a Moms and Tots class and loved it. By age 7 she was good enough to make the developmental team and begin competing. The past 4 years she's made it to state, and 3 years ago she took first in state in All Around. She's made some great friend on team and lives for gymnastics. At the ripe old age of 9, Sage said her goal was to "get an autograph from at least 1 Olympic Gold Medalist before she reached double digits"! Her words, not mine. Cracked me up, but she did it. 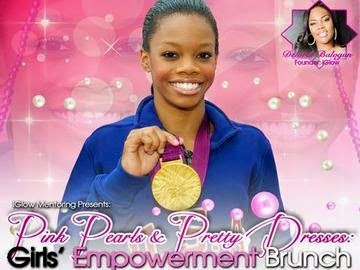 We also got to meet Gabby Douglas at a charity breakfast, later the same year! We got to see Cathy Rigby play an awesome Peter Pan via Broadway in Chicago, when the tour came through town in January 2013. And we got autographs from Chicago speed skater Nancy Swider-Peltz jr whose coach/mom was an Olympic speed skater and whose younger brother is also in training, spring 2014. Aly Raisman-Olympic Gold Medalist signs photos at American Girl Place, Chicago. Shown with 9 year old Chicago competitive gymnast, Sage. Aly says her favorite event is floor (her best event as well--as she took the Olympic Gold for her floor routine!). When she asked Sage what her favorite is Sage replied "I like floor, too, but my very favorite is bars." 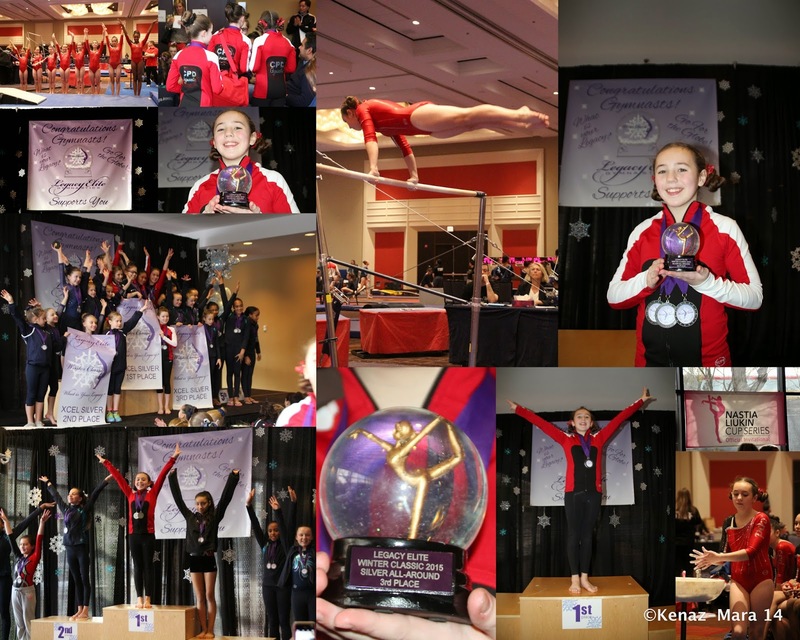 Sage will be competing in her first USAG (Jr. Olympics) Meets this January. She's competed the past two years in the IPDGC meets, going to state both years and taking first in state in 2010! 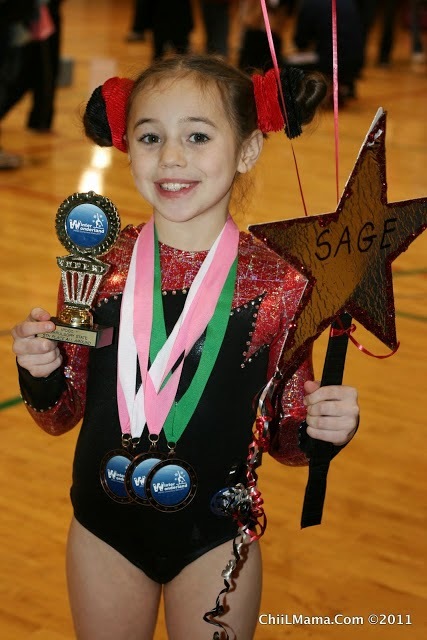 Like Aly, Sage started gymnastics as a toddler in Moms, Pops and Tots classes and never looked back. At age 9, Sage practices 10 hours a week with her team and does an additional 3 hours a week of circus arts like lyra, Spanish Web, Chinese Pole, acro, unicycle, juggling, trapeze and silks! From the very start, back in 1st grade, we told Sage, to just do her best, we were proud of her no matter what, and medals and trophies didn't really matter. Her response, "If I'm gonna to do this thing. I'm gonna win it!" Miss tiny but mighty goes to state at age 7--1st grade. 2010 Beach Meet, back when big bro competed too. Dugan-2nd place medal, Sage-4th place ribbon (1st meet back after broken ankle cast for 4 weeks).